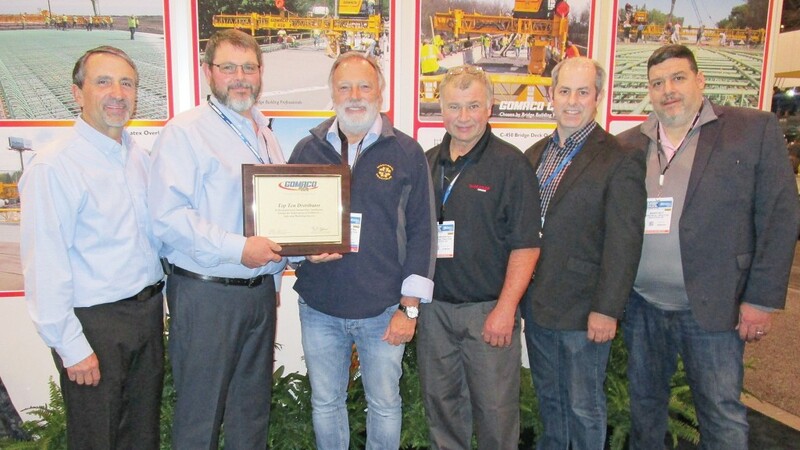 From left: Bob Leonard, GOMACO United States and Canada Sales Manager; Travis Brockman, GOMACO Canada District Manager; Enzo Masciotra, Montreal Tractor Inc.; Brian Keveryga, HMA Equipment Co. of Canada; and Max Petrin, and Mario Roy, Montreal Tractor Inc.
GOMACO Corporation is the worldwide leader in concrete construction equipment with headquarters in Ida Grove, Iowa. GOMACO equipment will slipform concrete streets and highways, airport runways, curb and gutter, sidewalks and recreational trails, safety barrier, bridge parapet, and irrigation canals. Support equipment includes grade trimmers, concrete placers, concrete placer/spreaders, and texturing and curing machines. The company also offers equipment to finish flat slabs, bridges, and slopes. GOMACO will consult on equipment for large or unique concrete paving projects. Products are offered through a worldwide distributor network for local sales, parts and service expertise.